While other cities press ahead with proven methods to provide space on their streets for cycling, London constantly gets distracted by bonkers schemes that look pretty but couldn't possibly work. That's the message of an article by influential urban designer Mikael Colville-Andersen who calls London the "Village Idiot of Urban Innovation". Colville-Andersen says he sees progress toward livable cities and the reduction in the dominance of the car in city streets all over the world. He quotes the Mayor of Paris until last year, Bertrand Delanoë, who said, "The fact is that cars no longer have a place in the big cities of our time". But despite the hope he sees, Colville-Andersen also sees "wackiness to make you roll your eyes" from the class idiot, "the kid … who isn't paying attention and disrupts everyone else with unruly behaviour and lame jokes that fall flat and do little to garner respect. "In the realm of modernising transport in our cities, it would seem that the kid is London." What's the British capital done to earn this derision? Colville-Andersen is aghast that schemes to take cyclists off London's streets keep being proposed and apparently being taken seriously. Three recent London cycling infrastructure proposal have him replacing his printer ink with vitriol. First up, Norman Foster's SkyCycle, above, which he says puts "cyclists on a shelf at the behest of Motordom. Keeping those rascals off the streets and offering them little access to things like... oh I don't know... shops, schools, cafés, restaurants, businesses, workplaces." It'd be a £220 million folly, he says that would would take cyclists off the streets and remove them from the urban fabric and places they need to go. Fortunately, SkyCycle was shot down in 2014 by mayor Boris Johnson. At £600 million, Colville-Andersen's next target has the same problem, but costs even more. It's the River Cycleway Consortium's floating cycleway on the River Thames. "I don't even know where to start with this one," Colville-Andersen writes. "The rendering, above, doesn't even have any off ramps. Is it recreational? Who knows. Who cares. Another architect so far removed from the reality of life in cities." Over at CityLab, Feargus O'Sullivan knows where to start. He writes: "The proposal isn’t just wrong. It’s a whole club sandwich of wrongness, made up of many delectable layers of stupid." The cost of the floating cycleway would be enough to build a segregated network all over London; it would rise and fall with the tides; it'd be buffeted by boat wakes; and by connecting two business centres - Canary Wharf and central London - it would ignore the thing many Londoners use bikes for, commuting. 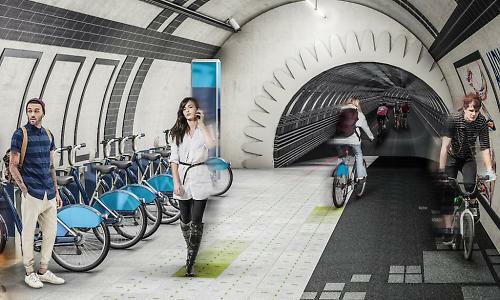 Next up, Colville-Andersen takes aim at the most recent wacky cycling infrastructure idea, the London Underline, which would turn disused tunnels under the city into bike routes. "Welcome to Watership Down for cyclists," he writes. "THIS is what Fiver envisioned that scared him so much while at Sandlewood. If the Skycycle and the river thing seem inconvenient and out of touch with reality, words fail me for this one." What these schemes share, he says, is overcomplication and a failure to provide for the way people actually use streets. He writes: "If you look at innovation regarding bicycle infrastructure, you'll notice that it always prioritizes cyclists and serves a practical, logical function. "You'll also notice that they are simple in nature. Simple, rational and functional. Based on an understanding of how bicycles in cities used to work, still work and can work. "Innovation in cities is simple. Use 7000 years of experience. It's right there. It's free. It works. Truly smart cities don't overcomplicate."